Night fishing for trout is a way of life here in Michigan. Traditionally people start fishing after dark beginning in mid June with the onset of our Hex hatch. By the middle of July the majority of our hatches have come and gone. Terrestrial fishing is beginning to heat up and our weather has shifted to warmer and more humid days and nights. However the larger fish in our rivers still prefer to hunt during the darkest hours. As the Hex Hatch winds down a lot of folks will retire for the season. They start breaking down their rods and reels and hanging their waders up until next year. In my opinion this is the time of year that the night fishing really begins to take off. A technique we commonly refer to as “Mousing” provides us with the means to perform at night. The crowds are gone and food is limited making for some hungry predators roaming about in the dark. This is our second chance to seek out the larger trout we missed during the Hex hatch. In addition we locate new fish that have not shown up on the radar as of yet. I love the Hex hatch and the opportunities it provides an angler to cast at larger trout feeding on the surface. However, I still feel lthat mousing is your best shot at the largest trout of the year. Mousing is a form of night fishing that has gained considerable popularity here in the Midwest over the last ten years. This technique has been around since before my time. It has provided anglers with a plethora of species to target and different times of day to achieve success. In Michigan we need the night time to make it work with conviction. 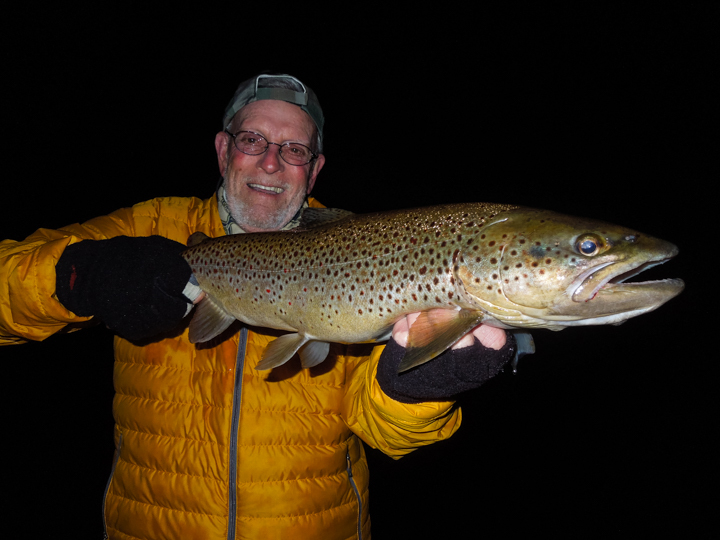 Trust me when I say “the night time is the right time and mousing is a hair raising experience!” The technique is aggressive and explosive, and much like streamer fishing you are targeting the larger predatory trout in the river. Fishing on rivers such as the Pere Marquette and Manistee River will allow the angler plenty of shots at trophy sized trout. It will often leave you on the edge of your seat. As with most fly fishing techniques presentation is very important. Fly placement, casting angle, pace, and moon phase are all keys to success. Having an understanding of all four elements will dictate your outcome. Casting tight to the bank is a must, remember that mousing is a searching technique and you want to cover the water thoroughly. Fishing the outside and inside banks of the river will also help you locate areas fish might be utilizing in the dark. It never hurts to have a few addresses as well. Knocking on as many doors as you can night after night will definitely increase your success. You can move your fly with popping strips, let it drift and then move it again. Another option is you can move it with a steady pace creating a constant wake behind the fly. Remember mousing is a game of cat and mouse. You want to keep the fish interested long enough to elicit a strike. Dark nights tend to be more productive and knowing when the full and new moon cycles occur will help you to determine the best times to go. There are plenty of lunar charts on line and having a couple of your favorites bookmarked will aid you in planning your next night time adventure. Mice, frogs, waking flies, gurglers, and push flies are all examples of fly types we use. Mice and frogs are pretty self explanatory. Flies that emulate the size, color, and silhouette of your local mammal and amphibian populations are a great place to start your fly selection. Waking flies and gurglers are designed to float high and move a lot of water creating a very well defined wake. Some nights this is very important to triggering strikes. On other nights the fish will be more apprehensive to lash out at this presentation. 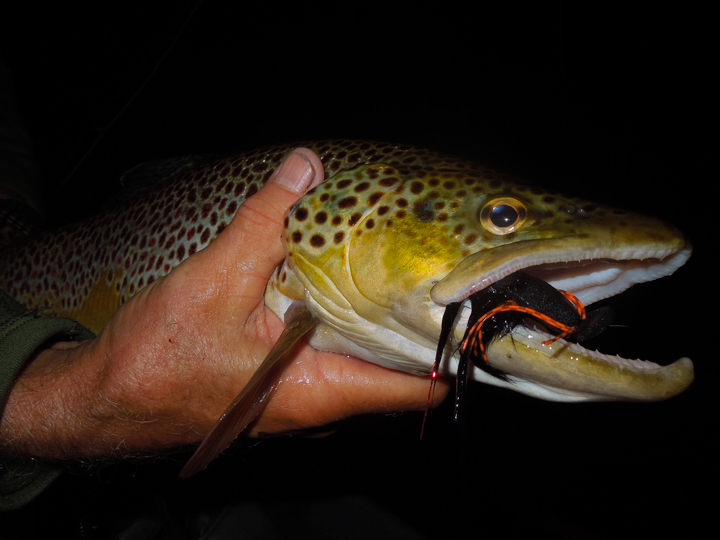 The push fly is the answer for those nights where the fish are more cautious. When they don’t want to explode on your fly. A push fly is any fly that can be fished in the surface film or subsurface. Having flies that can perform at all the necessary levels of the water column will increase the potency of your fly selection. That will ultimately lead to more and bigger fish to be caught and photographed. 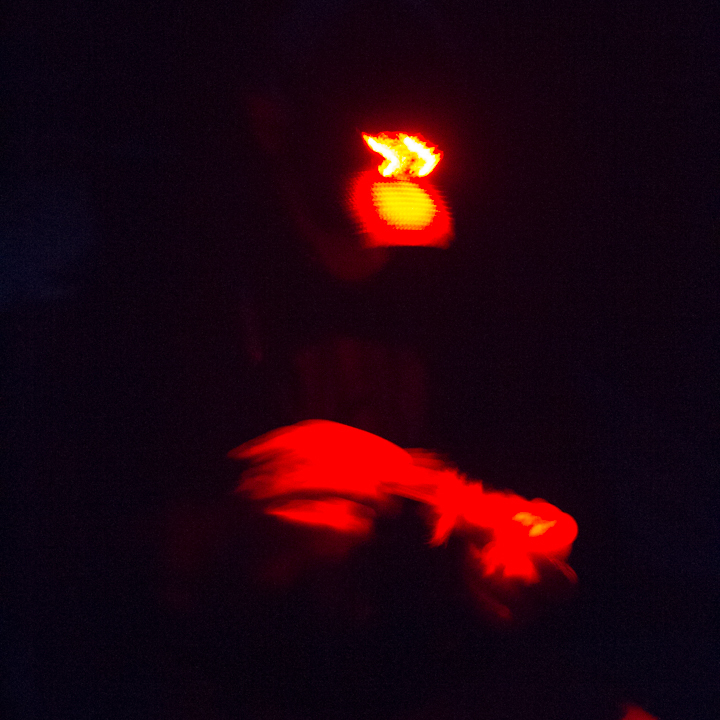 Many people are unsure about fishing in the dark and mousing is not for everyone. Night fishing can be safe as long as you take the time to learn the water you are fishing before the lights go out. Fishing with a friend or a guide is a great way to increase your safety and knowledge of the water you will be fishing. The advantage of fishing in a boat is priceless, not to mention the safety factor, but the ability to cover water can, and on some nights will, make all the difference in the outcome of your trip. If you love to hunt big fish and chasing trophy trout is a passion, mousing can provide the angler with one of the biggest windows of opportunity to cash in on Michigan’s big trout. Peak times to target trout using this technique would be from July to September. There are always exceptions to the rule and opportunities may present themselves earlier or later during the trout season depending upon conditions. There really isn’t anything else in the fishing world that can compare to the peace and tranquility of the stars overhead followed by the sound of a violent explosion interrupting the calm of the night. The resulting hard pull from a big trout down below is what it is all about! The intensity of the take and the anticipation of the next hit is what keeps us up all night, and by the nights end it leaves you craving more.